To see each day's program schedule click on "contributed talks" in the overview above. On Monday, the conference desk opens at 8.30am. It is located in room MA143. Signs will guide you there. All other days, the conference desk opens around 9.00am. We will post maps and guides to the locations on Wednesday/Thursday here and in MA144. There will be an informal get together on Sunday evening (September 4, 18h-22h) in the library of the mathematics building of the Technical University of Berlin. There will be some drinks and snacks. Simply drop by and relax from traveling... When registering for the conference, please indicate whether you wish to attend. On Thursday afternoon (September 8) we are guests in the celebration hall of the Berlin Academy of Sciences where the European Prize in Combinatorics will be awarded. The location is at Berlin's most beautiful square: the Gendarmenmarkt (find the entrance to the Academy opposite the Konzerthaus which is the red 9 in your city map, square H4). 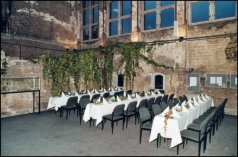 From there, the conference dinner is within walking distance, and we will have guided tours or you explore the surroundings on your own.